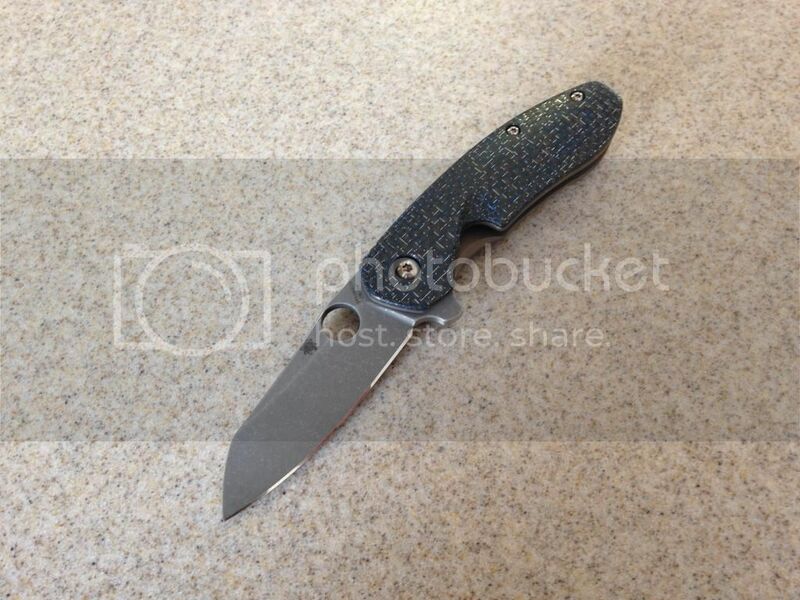 A spyderco Southard clone? Or a clone of a Brad Southard custom? One of my all time favorite customized production knives is the 2.9” cutdown Spyderco southard wit LSCF scale / LBS some guy from Europe made. I’m not really into ocollecting but if I was ever looking for showing off knife / collector’s knife (cause they’re to wide for me to EDC, I’ve had a stock one before) I would get one and cut it down like that. that guy did. A Spyderco Southard preferably. I don’t think I’ve ever seen a custom come up when I’ve searched in the past. I just got this knife today. I've been agonizing whether to put out the money for a while, but it kept gnawing at me. A true gentlemans folder, with M4 steel, titanium liners and woven silver glass scales. This knife really feels like air at only 1.3 oz. Almost weightless. I'll be carrying this every single day in my pocket, along with whatever blade is the EDC du jour. Here it is beside its big brother, Gayle Bradley Sr.
Kershaw CQC-4K came in today and I tried it out. 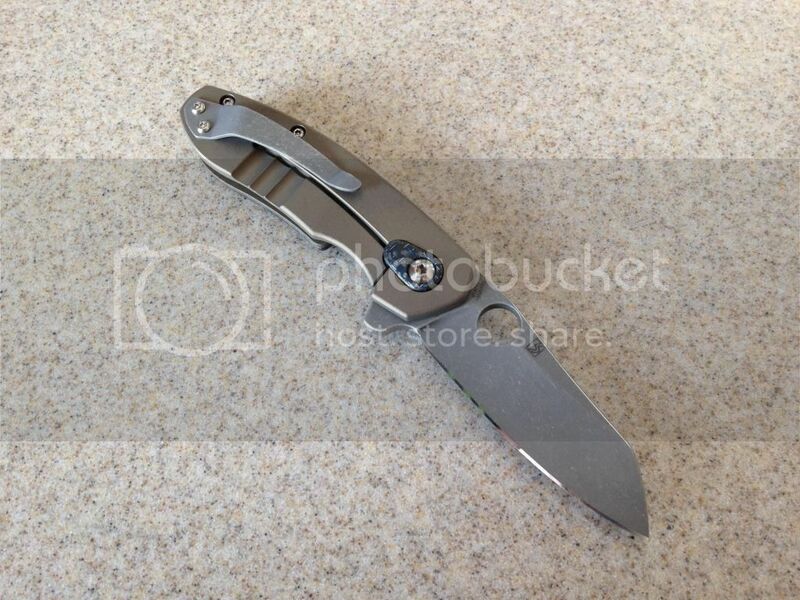 Someone on bladeforums did a mod to the cut out on the G10 because for whatever reason the cutout doesn’t match the thumbdisc and it is harder to flip the blade out. Also shown with the CQC-2K I got last week. Overall, the 2K is easier to flip the blade out using the thumbdisc, but the 4K is easier to press the liner lock in. The pocket clip also was not as grippy on the 4K, the 2K I had to play with it to try and loosen it up so it would be able to go ON to the pocket and come off. 4K just slipped right into my pocket….maybe too well. That little Gentleman's folder had me looking as well. The larger one, albeit spoken highly of by CK, I just can't like it due to it's lines. The handle shape, yeah, blade shape, sorry, no can do. I did, however, bite the bullet today on my very first Spydie... the Sage 2 with Titanium scales, framelock, and S30V blade is now on it's way home. I'm just a sucker for Titanium, can't help it. I had to think about the wharncliffe blade since I've never had one before, (except for a larger sailing knife). Thinking about it, I figured it would be perfect for all the tasks asked of a 2.55" blade. It's got a great point, and that even blade will be easy to sharpen. I'm wondering if I should force a patina onto the M4 steel. ...and it's weightless. You'll love that Sage 2. An all time great. I also got a Caly 3 CF with ZDP-189 steel today. It was like Christmas. Today I'm carrying my new Caly3 CF ZDP-189. I've got my Bradley Air in another pocket. Lots of great blades and some dam fin collections being shown here. My brother gave me a gift and asked me to carry it for a week and give it a chance. Well, now I am sold and really like the full sized Barrage, assist and all. I really though it was too big, ugly, not easy enough to carry in dress slacks, and the serrated part of the blade made it look ugly as hell. Well, now I am thinking about getting a second one. (Non coated and no serrations). I have never been a fan of larger knives, but I am 100% rethinking about that.. I actually traded the one below. Not that it was a problem carrying it. But it was assisted with a thumb stub. I’m not a big fan of that combination. You should give the mini barrage a try. I know where you can get a blue one. I was at Cabellas yesterday and looked at it. I was not to enamored by it. Kinda reminded me of the mini grip. I will say that the local knife shop had a few stryders and ZT’s that I am giving a second look at. ZT 560 is leading the pack right now, with the BM 477 emissary in the top 3 now too.) 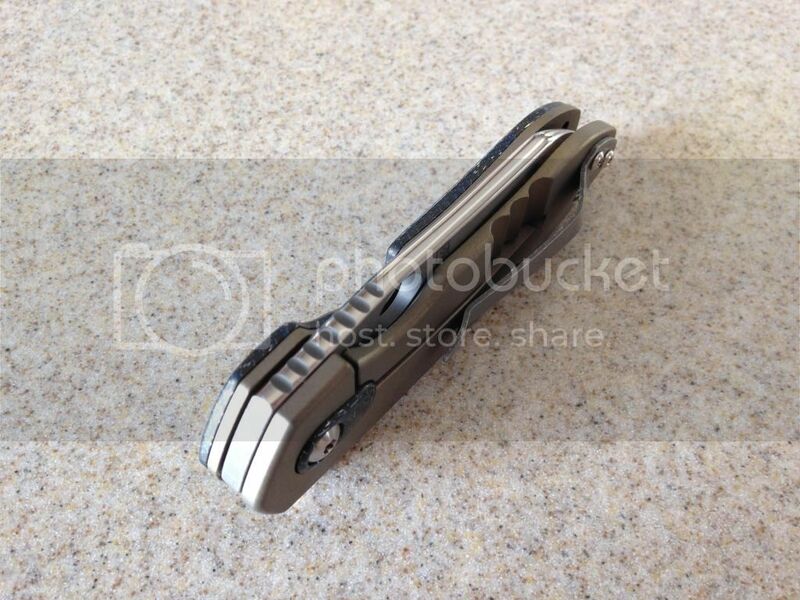 Lionsteel and Microtek also are getting a few more looks as well. I’ve been carrying this Freefall all week and I’m digging on it. It’s a little bulky compared to say a Delica, but I still like it, and it’s probably the smoothest deploying of all my knives. Most of the time I’ll have a Spyderco in my pocket. 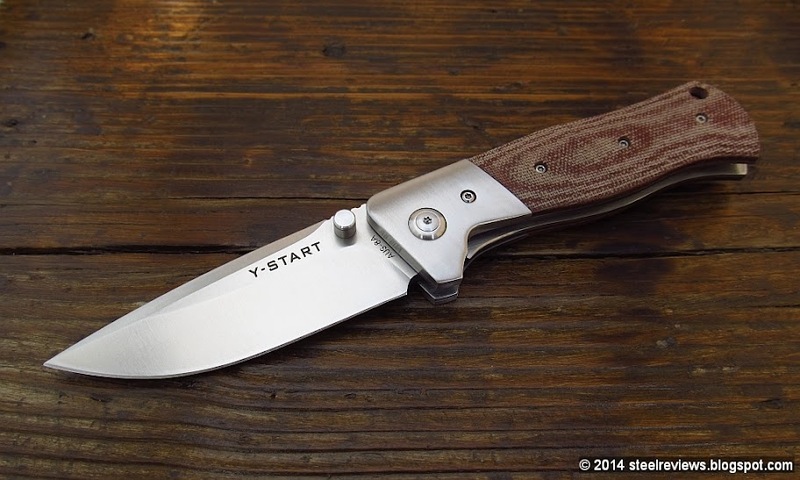 I like the Native because it’s super light with the FRN, but it’s made in Golden Colorado and has S30V steel. And here’s a random assortment of my favorites. I’ve been getting a lot of medical procedures done, so I carry a Vic to the doctor’s office. Nice Bone Collector, Dale. The fixed blade version looks really nice as well. 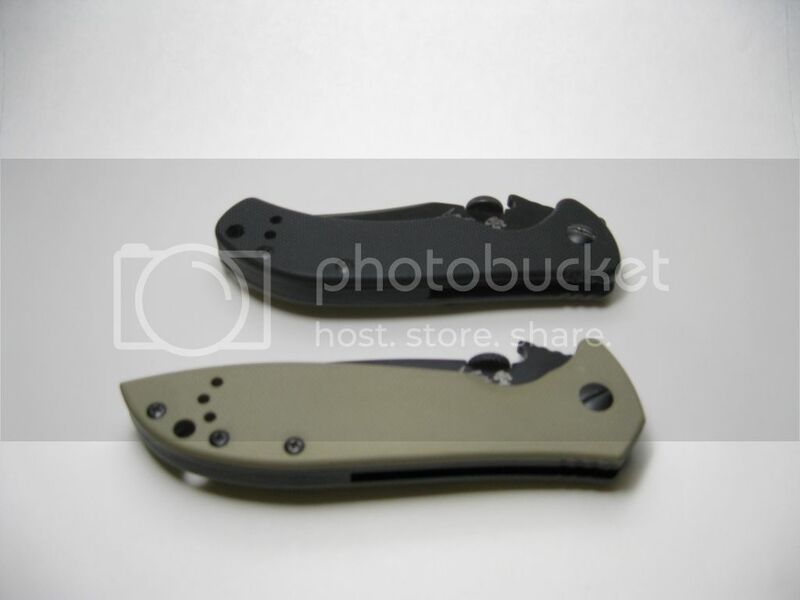 I had a Bushcrafter in my shopping cart and swapped it out at the last minute for a Tops, and now I almost wish I would’ve bought the Benchmade. I’ve been really looking at the Bone Collector fixed blade. The Tops is nice, but I’m still looking for that perfect camp knife. Wow. I looked them up and found this one. Hopefully I’ll come off disability soon and have money. Really nice EDC blades. I can't believe I've never seen a review about thes knives anywhere. Slim and elegant. The perfect suburban EDC. Really nice jiimping top and bottom. Reminiscent of Spyderco jiimping. Two tone aluminum scales. if you bump the thumb studs with your thumbnail, the blade flies out as if it was spring assisted. It's not, but I had to check. That's how fast it is. I was really hoping to get a blade with the DLC coating on it, but the Spyderco Sage 2 appealed to me and it wasn't offered in that treatment. And Spyderco tells me they don't offer it as an aftermarket service. Anybody know where I can get a blade DLC coated? Someone told me Frog lube was a good alternative for keeping things moving and slick. One of the reasons I like it is that it is non toxic. Anyone have pluses or minuses to using it for knives? First hand, saw some, read about it, or just short of making stuff up about it? Excellent lubricant with additives (PTFE lubricant), great for guns too. Really nicely built. Like I said, I’ve never seen them mentioned anywhere. The undiscovered sleeper EDC. Got this blue Kahr Arms Delica 4 sprint run the other day. It has been in my pocket and backpack ever since – and it will definetly stay there for a long time.